On the needles last week and now my head has a warm, wooly cover for the frigid prairie temperatures which have settled in on us. It was knit up in Patons Classic Wool Merino in a neutral shade to match a scarf and mitts that my sister gifted to me awhile back. Kind of ironic that I am talking about gifts given, while I knit for myself. Where are my priorities for the festive season. Really, I should be concentrating on all those cast-on gifts that will be due in just over 3 weeks. Eek...is it true? Christmas is only 3 weeks away!??! Let the meltdown, I mean countdown begin. 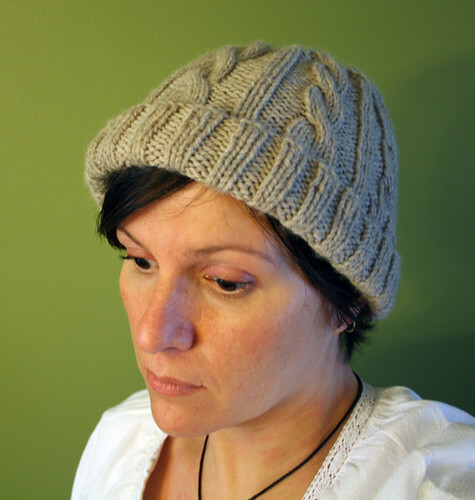 I just ordered yarn for a birthday present for my husband and this hat may just be the ticket. Simone, if you are going to make it for your hubby I would lengthen both the ribbing by another inch and also add in another set of cables. 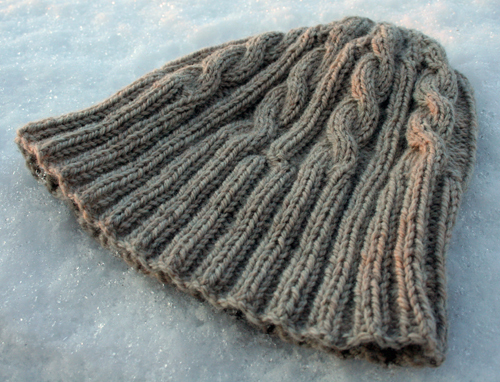 I wouldn't mind my hat being a bit longer in the ribbing at the very least.